I have just returned from visit number 12 to Belgium! Che Fortuna! Here’s how it all happened. I am teaching an International Baccalaureate (IB) course called Language A. (I teach it in English, but it is offered in dozens of languages). I already have training in Language and Literature, but it’s a different track for English than my school offers. I applied for funds through the professional development committee to go, originally for December in Oxford, but it’s a crazy time of year and I had already received some funding, so I applied again for spring semester. The soonest course was in Brussels, Belgium. So once again, back to one of my favorite countries. As you may recall from my previous Belgium post My Magic Bruges , my heart lies in Flanders – the Flemish (Dutch dialect) speaking region north of Brussels. But while I may love Bruges the best, Brussels is certainly nice. It was a whirlwind. I worked on Thursday, my crazy day, for four 80 minute classes, jetted home to get my bags and dash to the airport where I had to transfer in Rome, finally arriving in Belgium at midnight. Brussels airport is super convenient with a rail connection to Brussels Central, so I did that then groggily showed a taxi driver my hotel info and arrived at my hostel/hotel around 1am. Whew! Reception normally closes at 22:00, so I’m so glad I notified them in advance and someone waited for me. When I arrived, I soon learned that he was “going to sleep for three hours” because then he had to work again very early in the morning. Yikes. I awoke the next morning to pouring rain as I had a yummy hotel breakfast – just some warm croissants and breads along with coffee and OJ. I was worried about my transport connections to the Management Conference Center, so I jetted out and on my way. I somehow got on the right tram, but in the wrong direction, with foggy windows and no signs to announce the stops, it was a collossall guessing game. Where am I? Where am I going? I dunno. Eventually I asked someone what stop we were at, then I learned I had gone the wrong way. I am not necessarily a shy person, but with certain things I’m painfully shy — asking strangers for directions – yeah, that’s tricky for me. Everyone was being super helpful, but they were also confused, too. The directions listed the wrong name for the tram stop, which thanks to google maps and some help from tram riders, we learned was Baili. Next, the website said, “once you get off at the stop, the Management Center is a short walk away.” No map, no indication of the direction. Nothing to help. Again, luckily I had a google maps printout with me as well, but that was not exactly correct. One woman said, “I worked at that stop for 20 years, and I have never heard of that place.” There was a lot of passing around of my documents, a lot of discussion and a lot of wishes for good luck. We had a while to go, so we chatted about books and how much she loves Faulkner. So friendly. Everyone was so kind, and I was so grateful. Once I exited, I clung to my soggy paper and finally found my way. After a hard start, the day was lovely. My teacher was extremely warm, positive and helpful– an IB English A teacher in London. We had people in our class from all over the world: Russia, Netherlands, Turkey, Jordan, Poland, Italy, Switzerland, Slovakia . . .and all teaching in different languages. Very cool! The information was extremely helpful for my coursework. We shared ideas, and it was all information my students and I desperately needed, so I soaked it up like a sponge and the days flew by. They provided us with coffee breaks after 90 minute sessions. Yummy treats, and then an absolutely delicious lunch buffet. The first day, there were cheese croquettes as an option! My favorite! And two different types. I just love how these are done in Belgium, fried perfectly crisp with a sumptuous filling. I need to write poetry about these cheese croquettes to do them justice. They also had a huge salad spread with smoked salmon, meats, tasty raisin and cranberry bread . . . I couldn’t stop eating, and even went for a second helping of croquettes. Even little glass bottles of coke. And one of the dessert options at the buffet was creme brulee. At a buffet! At the end of a long yet productive day of coursework, I grabbed a fresh-made warm waffle with chocolate sauce, whipped cream and ice cream, then headed straight for a train to Ghent, where I’d meet up with Jasper, one of my Belgian friends I met in Bruges in the summer of 2001 — all those years ago. Both Jasper and Dave have become really good friends, and due to both my love for Europe and Belgium, I get to see them a lot. “So move to New York, ” I said. And I hear that from so many Belgians. They often love to talk about and visit New York. They have a fondness for America, American things, and American people. (Do they like me for me or my country, hmmm?) Yet they wouldn’t want to leave their country. I can’t blame them. It’s a good , peaceful life. People are provided for. Overall, it’s calm. It’s a beautiful country with beautiful people and delicious food and beer. Yeah, I get it. I had to get some fries. Though they try, they just can’t get them right in the “Belgian Fry Shops” of NYC. This night, I tried the Mammoet–sauce (mayonnaise, tomato, onion,glucose, garlic, soy) because I remember loving it out late in Ghent in November. To help me choose, the girl put four different sauces in a dish for me to dip a fry in to taste. Cool! I loved them all, but chose the Mammoet for this night. I refused to feel guilty devouring the fries as he counted calories and just ate his traditional one fry in sauce. I was in Belgium and I was determined to eat my way through it. As usual. We had some good laughs, sharing memories over the years, and then I had to dash home to catch my train. Bummer. I’m usually here on holiday, where I can crash if I miss the train — no big deal. But my class was super important and super expensive for my school, so I wanted to make sure I got the most out of it. I arrived back at Brussels Central and decided to walk to my hotel that night, through the Grand Place, past students, locals and tourists out for Friday night fun, and I got to my hotel around 1 am . . .again, and passed out exhausted. 7am rise the next day. Another pleasant hotel breakfast, another amazing and informative day of class along with fabulous lunch (Turkey Cordon Blu), then I dashed to the train for a ride to BRUGES! I was so excited both Jasper and Dave agreed to meet me in Bruges this night so I could see it. 🙂 Jasper hopped on the train in Ghent, and Dave was already home in Bruges for the weekend, so he would drive over later. We walked through the market square, passed the Belfry, then stopped in a fry shop where I indulged in bitterballen — fried balls filled with something delicious. Then I had a Kaas Kroqet. mmm. After, we had beers in a bar I visited several times before, including NYE 2010. When Dave arrived, we went to a bar on the T-Zand, the other big market in Bruges, with the fountain. I had a Brugse Zot (Bruges Fool) and a Kriek, followed by profiteroles. mmmm. Dave was distracted because he had a crazy girl stalking him and getting him and his friend in trouble with their girlfriends, so he was outside on the phone for much of it. But we understood. Then all too quickly, it was time to catch the train home. Jasper and I said farewell to Dave, boarded the train, and he departed in Ghent. I wanted to snooze, but Jasper said, “That’s not social!” So I stayed up to spend time with him before my next visit. Back in Brussels late again, and again, I arrived at my hotel around 1am. Really exhausted now, but it’s all worth it. The following morning, I rose early, ate breakfast, checked out and left my luggage, and darted to class for the last time. It was a super helpful conclusion. We said our farewells and had lunch at 12:30. I sat with my teacher and a woman who is an admin in Lebanon. I’m going to try to arrange a visit. After, I strolled around a Brussels park a bit, at the stop called Parc on Tram Line 1 and 5. Then I got my luggage and headed for the airport an hour early. I wanted more fried food, but didn’t have the opportunity there. I did have the opportunity to purchase some Neuhaus cocoa powder for hot chocolate. mmm. To kill time, I had a nice Leffe Brown beer in the terminal and headed on a long journey home, transferring in Rome. I arrived in Genoa before 11:30, but by the time I waited for the air bus, switched to the local bus, and walked home, it was almost 1am . . .yet again. The next day at work, after going, going, going — I was super exhausted. But I was also glowing because it was an awesome, productive and fun trip filled with much joy and a lot of food. I don’t know how this is possible, but I swear my pants already don’t fit. Worth it. **Please note, there seems to be an issue with inserting a slideshow in WordPress. The button is no longer there. Any ideas? I inserted a gallery this time instead. November 1 and 2 is the All Saints holiday in Italy, so we had off that Thursday and Friday. As with any break, it was time to travel somewhere. I chose to visit Bruges, Belgium to see one of my favorite cities in the world as well as good friends I met over 11 years ago. This was my 9th visit to Bruges . . .10 if you count 2002 where I visited twice during one long backpacking trip. There has always been something extremely magical about this fairytale city, a step back in time and a break from reality. A place to wander and imagine. While studying abroad in England in spring 2001, my friend Mike and I booked a mini break to Brussels, Belgium. We were looking for something different and new, and figured this would be a nice three day escape. Our travel agent in Banbury said, “Oh, you must go to Bruges. It’s very special. Canals, swans . . . you must go.” Mike and I kept that in mind. After wandering around the beautiful yet congested streets of Brussels, we returned to our hotel and saw a poster advertising a day trip to Bruges the next day. We signed up, and the next day, we arrived for a big surprise. I knew nothing about Bruges except the swans and canals. I was not prepared for the sights that had me spinning my head in all directions like my cat when we throw too many catnip mice at her. We oohed, we ahhed, we wandered, and we couldn’t stop snapping pictures — beauty everywhere. Extremely ornate baroque architecture, with intricate details on every piece of moulding and wood, from houses to churches. The carillon bells chimed throughout the day, a live organist playing sweet melodies for us at the top of the Belfry, the centerpiece of the quaint, picturesque cobbled square. The square was lined with restaurants, horse-drawn carriages, and tourists happy to discover one of medieval Europe’s best kept secrets. 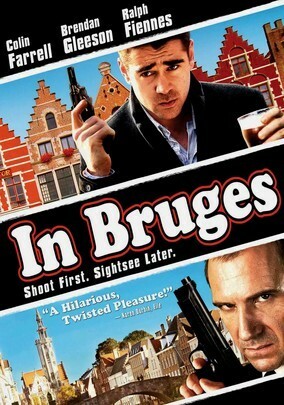 Back then before the release of the movie, who knew how beautiful things were In Bruges? Bruges is considered one of the world’s largest outdoor museums. That’s not necessarily a bad thing. How did it stay so well-preserved? Bruges used to be on the coast, an important port city, an epicenter for trade and Flemish art and architecture. But when the water receded, Bruges was no longer on the coast and the city was abandoned, almost forgotten for centuries. In the 1800s, when travel became a leisure activity, Victorian tourists “re-discovered” the beauty, putting Bruges on the map for the Grand Tour. Though filled with tourists, and tourism certainly has increased after the release of the 2008 movie, people do live here in this very special place. During our walking tour, we wandered down a cobbled back lane, and I peered at the lace-covered windows, wondering about the lives inside. What would it be like to live here? I’d like to live here. I need to come back. I was absolutely mesmerized, and then I tried the food. Fries like I’d never had in my life . . . crispy and flavorful, served in a white bowl, mayonnaise on the side. Chicken in a delicious cream sauce. I don’t know the name, I’m not even sure what else we had — I just remember the sensational flavors. This was so early on in my world travels, just my second time in Europe — and I was overwhelmed with sensory ecstasy. We took a cruise along the canals, dipping below low bridges, gliding past more intricate buildings and past the majestic swans, undulations trailing them. We sampled the rich chocolate truffles, watched some lacemaking, then we stopped at a convent for cloistered nuns. I sat amidst yellow tulips and imagined a life cloistered amidst all this beauty: thinking, praying, writing, reflecting . . . how peaceful. I envied the nuns a little bit. We boarded the bus and left the magical city, the spires disappearing in the distance before we entered the highway back to chaotic Brussels. I began to regret not staying in Bruges instead. I didn’t know. But I knew I’d be back. I had no idea it would be so soon. That was March 2001. That summer, my best friend Anna announced that she was going to be studying abroad for a month in . . . BRUGES . . . as she was working toward her culinary degree at Johnson and Wales. My heart pounded with excitement for her and a tinge of jealousy because she got to stay in that city, to experience life there like I had dreamed while wandering the streets. She invited me to visit after her studies. I had just returned from life abroad and was already dreaming of being back in Europe. My parents said, “We’ll buy you the ticket as your birthday present. You just pay for the hotel and incidentals.” I did not hesitate and booked my flight for that July, just two months after I had returned from England. Just before my 21st birthday, in low pigtails with a bright lifeguard tan, I boarded the plane for my first international trip alone. Oh yes, I had the travel bug big time now, and this trip launched the next phase of my adventures. I met Anna at a hotel in Bruges, and we rode bikes into the countryside, discovered a beautiful park, stumbled across a festival at a beer garden, and enjoyed summer beauty. Before heading to Interlaken, Switzerland, we ventured out to her favorite bar, Bras, located in another square by the fountain. I threw on jeans and my royal blue Superman tank top, and we were out the door. I remember being a bit tired that night but knew that I’d have a good time if I could just make it out. At Bras, I had my first Belgian beer. I usually involuntarily made “bitter beer face” every time I tried to have a beer when out, and instead opted for mixed drinks like vodka and cranberry. Anna ordered me a Duvel, and it glided right down with a pleasant aftertaste. Smooth. No headache. Nice buzz. We sampled different beers that night, including Hoegarden and Stella, enjoyed the music, talked to the bartenders that Anna knew well, and then . . . magic. A guy came up to me and said, “What do you think of that guy over there?” He pointed to a very attractive, tanned, athletic Belgian. “He’s cute,” I said. Shortly afterward, he came over and in his good but not practiced English, we began talking. And then . . . kissing. We kissed so long that the bartenders sprayed us with tap beers. We barely noticed. Anna said she had to make new friends. His name was Jasper and he had a fun, cute friend named Dave. I found out he had lied about his age when his mother kept texting him to come home. They were only 18, just having graduated from high school — about to enter college. I was about to turn 21 in a couple of weeks, about to enter my senior year of college. Oh well. Jasper scrawled his email on a bar coaster and the next day Anna and I woke up without hangovers and were off for an amazing adventure in another one of my favorite places, the Swiss Alps. At the end of that trip, Anna headed to Greece and I was back in Bruges for just a few days by myself. I emailed Jasper, he met me at Bras again with Dave, and a long friendship was born. Dave said, ‘We noticed you because of your Superman shirt . . . we thought that was so cool.” And then when they found out I was a lifeguard, I had to explain that, no, I did not know Yasmin Bleethe. We emailed throughout the year, and I visited the following summer while backpacking throughout Europe on my own for 3 weeks. This was my two visits in 2002 . . . and well, I guess you could also say I had two visits in 2001. Maybe 11 visits to Belgium depending on how you count it. 🙂 Bruges was the 2002 Culture Capital of Europe, so there were even more museum exhibits and cultural activities than usual. I explored Van Eyck paintings, I learned more about the history, I shopped on the quaint streets, and I ate well. Of course, I met up with Jasper and Dave at Bras and met some of their new friends and introduced them to some friends from Fordham that I ran into serendipitously on a back lane on the outskirts of town. I also visited Ghent University, where they were now studying in another beautiful canal-laden city with grand architecture. And then life happened. Emails changed and we lost touch. But we never lost the fun memories. In 2005, I received an email from my friend Charlie. The guys had posted a comment on his blog because he had mentioned my full name. I guess they were searching for me and they said, “this may be the Kristin we met in Belgium some years ago.” He asked if I knew them and said yes, and then we were back in touch. We kept in touch with emails, but I did not get back until 2006 when I was in Belgium with my entire family . I had to show them how beautiful it was. I’ll never forget the family’s faces as we walked to the market square at night on my birthday, August 11, 2006. Sweet 26. All lit up and a surprise feast for the eyes. Then an absolutely amazing meal at one of the restaurants, facing the belfry. Cheese croquettes. Delicious meal in various sauces. A special beer called Kwak that required it’s own wooden holder to keep the hourglass shape from tipping over. Bubbles and a bubbly mood. Have I ever been this happy? It was the only time our whole family traveled in Europe together, and we were in one of my favorite places. On a whim, I emailed the guys, and then we met at the fountain, just like old times. My brother met them and we were all fast friends, enjoying the music festival in town, talking in the bars until 4 am each evening, and just savoring the moment. They told my brother, “You are our hero.” Did I ever laugh so much? Good Times and Amazing Memories. Life got in the way again, but I was able to return in the summer of 2009 on a grand tour with my father to Switzerland and Belgium. Dave took me to a friend’s birthday party, then we met Jasper in Ghent for some beers and fun. I was back that winter to experience New Years’ 2010 in Bruges with my friend Krista. Partying till dawn and making new friends, it was another of my favorite experiences. I really enjoyed wandering the Christmas markets, sipping mulled wine, and peering at all the lights and Christmas decorations — one of my photos made it to the cover of my Christmas cards the following year. Summer 2010, Dad and I were once again traveling through Europe, and once again returned to our favorite city to wander the streets and savor the food. This time, I didn’t get to see Dave who was out of town, but Jasper and I met up a few times for good meals and good conversation. I also met up with Kai,Tobi, and Simone, friends I met at New Years. And my friend from NY, Josh, was backpacking in town that weekend, so we all had drinks together. Summer 2011, yup, I was back in Europe again. I spent a week in Italy with mom and Aunt Minnie, then flew to Brussels. At Dave’s new apartment in Ghent, he popped some champagne for the three of us to celebrate 10 years since we first met in Bruges. Anna said, “I wish I could have been there. And who’d have thought that you’d still be in touch all these years later?” We were grateful for the friendship, and I said, ‘Here’s to the next 10 years. Hopefully I’ll come with my family one day and our kids can all play together.” . This year, as always, it was great to see my friends. Thanks to facebook, I know everything that’s going on in their lives, and it’s so easy to just pick up where we left off, chatting, laughing, wandering. We had some good beers in Ghent. We ate delicious fries and bitterballen. We watched Dave’s soccer game and met his teammates and their friends and girlfriends. Everyday Belgium. The trip was quick, but there was plenty of time for a visit to Ghent and plenty of wandering around Bruges, beautiful even in the cold November rain. I was heartbroken and upset after all of Superstorm Sandy’s destruction in New York. I was feeling far away and alone, and this trip ended up being at the perfect time. The beauty and magic of the city soothed me as always. The long walks cleared my head while I traveled back in time. The conversations with my old friends were special as always, and I enjoyed meeting more of their friends. I ate well, laughed much, and soaked my soul in beauty. I have a lot to be thankful for this Thanksgiving as always, and I am very thankful for the many, many happy memories I’ve had in Europe over the years with friends, family and new friends. More about this particular trip in the photo essay.